Performance testing and analysis with SunSport Coaching is not like most other coaching centres – a focus on innovation has brought us to the position of being pioneers when it comes to utilising the latest wearable technology. But broken down to the most basic level, how can this help you to improve as an athlete? We recap some of the latest technology we use and what the benefits are to allow us to help you to improve and to become better, faster and stronger in your discipline. Over the past few years we have been reinforcing our status as THE Moxy Monitor centre in the UK, as the only certified UK athlete test centre to offer the service. Moxy is a small, wearable sensor that monitors oxygen levels in the muscles of the athlete whilst exercising, and the device offers a new and improved way of testing athletes compared to the common lab testing methods. Moxy Monitor has fundamentally changed the way SunSport Coaching has approached the performance assessment of athletes and the subsequent training interventions we make afterwards. As a forward thinking team, we are always looking to embrace the latest technology and pioneer new ideas. Simply put, Moxy Monitor has been a game changer in how we work. How does Moxy work? Once set up, with the subject wearing the Moxy Monitor, the device provides real-time physiological feedback. This can be for any sport, and does not need to be contained within the test lab. So, whether it’s out cycling, on the water rowing, in the pool swimming, you choose and we test you in your environment in real time. This means that we can run our performance tests both in the controlled lab environment, and also in a real world environment to mimic the same conditions you experience when training and racing. Direct feedback during your assessment also allows us to make real-time adjustments to see how these affect performance, such as pedalling technique and efficiency, bike positioning, and much more. Given the flexibility of how, where and when we use the Moxy Monitor systems, it’s something that we offer our athletes who come to Mallorca on our Performance Training Camps. We’ll soon be taking livery of our new PNOE device – the world’s first breathing analysis device that makes carrying out a Cardiopulmonary Exercise Test (CPET) as easy as a 10-minute workout on the bike. 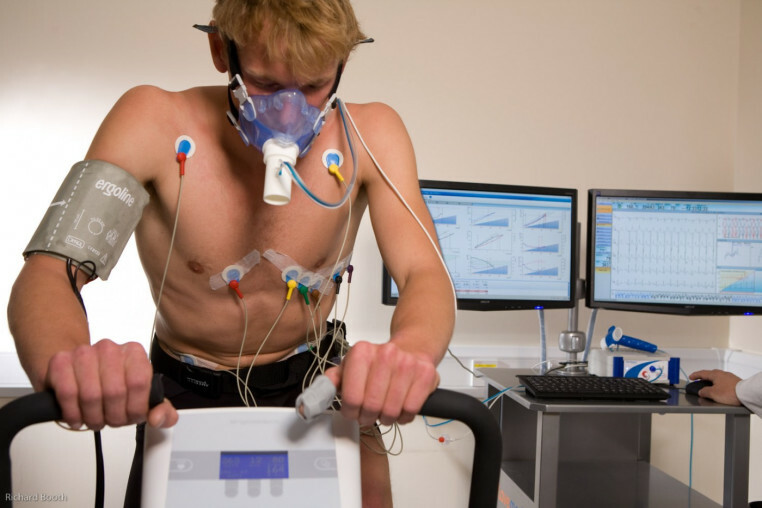 In simple terms, this is an accurate test to allow us to see how your lungs, heart and muscles react together during exercise, and so a short assessment at SunSport Coaching with PNOE will analyse how your cardiovascular and respiratory systems function with the added benefit of also screening for most cardiovascular and pulmonary conditions. We’re excited to start to put our new PNOE device into action, allowing us to continue to innovate and find new ways to analyse athletic performance. All of our wearable technology and assets provide us with the tools we need to test you in the most accurate way possible, gaining pin-point results that enable us to then tailor coaching to be as effective as specific to you, the athlete, as possible. If you’d like to undergo performance tests using a Moxy Monitor, or are interested in booking in to use our PNOE device with our performance experts and sports scientists, do get in touch. As with other items of wearable tech, a combination of different products while testing allows us to innovate and analyse a vast number of variables. Our EMG, an Electromyography device with wireless probes, allows us to dynamically analyse muscle activity … but what does that mean? In Lehman’s terms, the wearable tech device looks at how the muscles are functioning and coordinating giving real time feedback to allow the coach to look at how to improve technique or training to increase muscle performance. Some of the areas we test using the EMG device are ‘gait analysis’ for runners, ‘cycling technique’ – both during performance testing and bike position analysis, and strength testing across disciplines. To find out how you can put these various devices into practice, visit our Fitness Testing page.